7:15-8:00p - Take a break for dinner. So, counting the time it's taking me to make this post, I've made it to 20.5 hours. In that time, I've finished 5 books and read parts of 2 additional books. I also read 66 pages of The Comet's Curse and 111 pages of The Evolution of Calpurnia Tate, which I am really enjoying. I'd love to keep going, but I don't think I can keep my eyes open for much longer. My total number of pages read is 1528. I hit both my goals this year, which were to read for at least 20 hours and finish at least 5 books. I was also able to visit a lot of blogs and leave encouraging comments (so important!) and I really appreciated the encouragement to Tweet and socialize. I think for next year, I might set a mini-challenge for myself to visit and comment on a certain number of or percentage of participating blogs. The sense of community this year was great and I know that comments and tweets from everyone kept me going! Plus, visiting blogs and talking to people about the Challenge made a nice break when I just couldn't read for a minute longer. Great job, everyone. And if you're still finishing up, READ READ READ! You can do it! Keep up the good work! Congratulations! 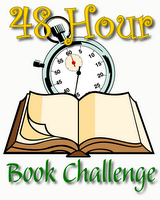 I didn't participate in this, but did the shorter Mystery Read-A-Thon for today. I didn't hit my page or book goal (came very close on books, not bad on pages) but I had a great time anyway. Go Abby!!!! That was an impressive run on Sunday! I don't think I could have done that. You are awesome! Yeah for the 20+ club! Who's going to write the club cheer? Kidding. I'm glad you liked the networking time. It was a huge part of the challenge for me too and a great addition. Made it feel more connected. I'm already thinking toward next year, too, so you're not the only one. I started with Calpurnia Tate. It was an inspirational kick-off. I am amazed at how slow a reader I really am. anyway, Congrats. Congratulations on meeting your goals! It looks like you read some terrific books. I can't wait to read your reviews, especially of Marcelo in the Real World. Yay, good job Abby! Looks like you got to read some great books. I had a lot of fun this year too. I know I appreciated your comments, Abby. Definitely, the comments helped keep me going. I like your idea of a specific personal goal to comment more next year - I may have to try that. I think because of participating in previous years, even though I knew that the commenting time counted this year, some part of it still felt a little like cheating, and I didn't do as much as I could have. But yes, a couch is essential! I read on my old couch, though, because our new one is a bit TOO comfy, and I was afraid I'd fall asleep. congratulations on a great job! I think you are right about the comments. I really like going around to see how everyone did and I really appreciate all the comments on my posts. That is part of the fun for me. A commenting mini-challenge is a great idea!